A visual poem of incomparable beauty, this masterpiece from Tunisian director Nacer Khemir (Wanderers of the Desert) begins with the story of a blind dervish named Bab’Aziz and his spirited granddaughter, Ishtar. 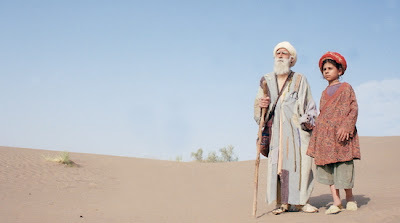 Together they wander the desert in search of a great reunion of dervishes that takes place just once every 30 years. With faith as their only guide, the two journey for days through the expansive, barren landscape. To keep Ishtar entertained, Bab’Aziz relays the ancient tale of a prince who relinquished his realm in order to remain next to a small pool in the desert, staring into its depths while contemplating his soul. As the tale of the prince unfolds, the two encounter other travelers with stories of their own – including Osman, who longs for the beautiful woman he met at the bottom of a well, and Zaid, who searches for the ravishing young woman who fled from him after being seduced by his songs. i am really looking forward to watch the movie which is now playing at NuArt Theatre here in Los Angeles just for this week only. check your local theaters or movie rental places. its a movie definitely worth watching!